There were 108 students sharing one Braille Quran at the Kashipur Blind Hifz madrassa and orphanage in Khulna, Bangladesh. A lecturer at the Khulna Engineering University wrote to AlFitrah foundation to ask for some Braille Qurans for the madrassa. 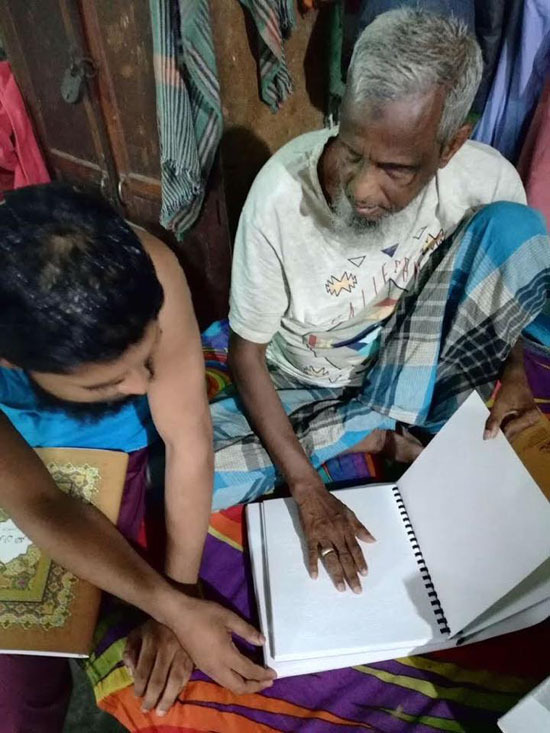 In the photo we can see an ustaz and his student checking through the Braille Quran we sent them. Alhamdulillah they were very happy with it and asked us to send more . 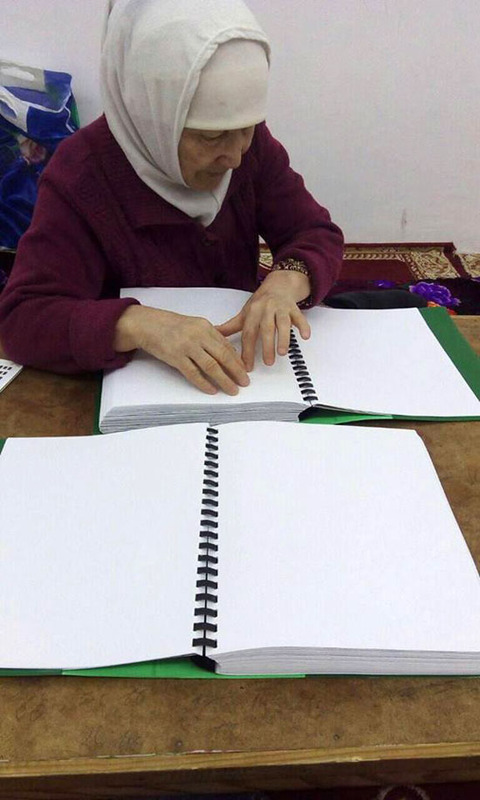 Alhamdulillah this grandmother in Kazakhstan is reading Surah AlFatihah for the first time in braille. She is reading a Braille Quran from Persatuan Org Cacat Islam Malaysia PERTIS brought by Malaysian brothers who work in Aktau. AlFitrah Foundation was honoured with a visit by the Director and staff of the Kedah Public Library Perbadanan Perpustakaan Awam Kedah. We gave them a copy of the Holy quran in braille , as well as our other braille publications, and 2 sets of braille chess. Inshaa Allah we will reciprocate with a visit in July for Pesta Buku Kedah, where we can bring more of our braille books. This afternoon Alfitrah Foundation went to Masjid Amr ibn Al Aas to hand over our monthly contribution to the food bank. It was good to hear about the community programs from Imam Abu Zar and Bilal Reza . May Allah bless all those who take part in these efforts . The jemaah are encouraged to bring a food item with them to donate to the food bank every Friday. In this way everyone has a chance to be involved in acts of charity. Alfitrah foundation has an ongoing project to send braille Qurans to schools and centres all over India. On 18th March last sunday there was an annual gathering of blind students in Hyderabad. They distributed 20 copies of Braille Quran to students who completed learning Braille Quran. Jazakallah for all those who supported.